ALL OUR YESTERDAYS - An editor looks back... I still can't understand why I didn't put the Issue Number and Date on the cover of each magazine, it makes it so difficult when trying to look up old copies... probably I didn't really expect them to be such a useful source of information so long after the event. We had real problems with my old electric typewriter around this time. It was quite a difficult machine to get repaired, and we were without it for over two months while some crappy repair company messed us around. If that delayed the issue, moving house didn't help, as me and Ann finally decamped to a nice end terrace house not far from Hillsborough football ground - and close to two river valleys so I could roam around and explore the countryside and the industrial archaeology which abounded therein. It wasn't long before large millstones began arriving back at the new house. We even roped in dpas member Pete Judd to drive our removal van for us - that'll teach him to come and study in Sheffield! He got his own back by doing a u-turn with us in the back of the van. Issue 27 was important to me, as it carried our first detailed interview with a former member of Deep Purple, having tracked down bassist Nick Simper. Although Nick still had problems about his departure from the band, he was happy to chat at length about his career. He'd just made a tentative return to the studios with a single, and was about to do another. We talked for hours in a room at the Pinewood Studios complex where his manager at the time had an office. Going through his old scrapbooks was great, seeing rare pictures which he kindly allowed us to borrow to get copied. 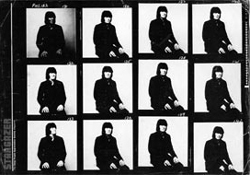 We ran the interview straight over seven pages and put Nick on the cover, with a contact sheet of his first Deep Purple photo session. Also in the magazine was the second part of our Purple Records story, this time with a full albums listing - and the news that Line Records in Germany were about to start reissuing some of the older albums. Whitesnake were back in the UK but having shed some of their older members, we were a little uninspired by the new line-up and without transport, gave this short tour a miss. Some of the reviews were very praiseworthy, others which we had the audacity to print were less complementary. David has never forgiven us. One of the ex-Whitesnakers was of course Ian Paice, and not being a huge Gary Moore fan, I'd given his tour a miss. 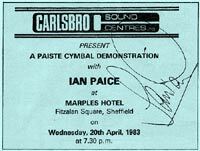 We did however have a chance to see and hear Ian properly when he did a drum clinic in Sheffield in April - upstairs at a dodgy hotel bar called The Marples Hotel (they used to have rock gigs for a time - we saw Nico there not long after). Seeing and hearing Ian up close really was an incredible experience. Glenn Hughes fans were also in for a treat with the Hughes / Thrall album out Stateside and it seemed for a time as if his musical career might be coming out of the doldrums. For many Gillan seemed about to enter one with the stop press news that he was joining Black Sabbath! As it turned out the union wasn't entirely successful. Perversely I rather enjoyed the album when it came out, but for most Sabbath fans it was a move they weren't happy with (and if Ozzie had joined Purple I guess we'd have been up in arms too). As for Deep Purple, there was lots to keep fans interested (and we were up to 26 pages, so there was plenty for us to write about), with much new material still being unearthed six years after the split. The main interest was the completion of the first book on the group, Chris Charlesworth's Illustrated Biography. Despite being at heart a Who fanatic, Chris's book had delved into the story in depth and uncovered loads of information. With hindsight, the book was done just at the right time. The band members had no reason to expect a reunion was likely (so they were all fairly frank), and while enough time had elapsed for them to have gained some sort of perspective on the group, it wasn't so far in the past as to make it hard to recall what happened. Despite the fact that Chris knew Ritchie from the days when as a Melody Maker reporter he used to cover the group abroad (and got up to one or two scrapes with the guitarist), Blackmore refused to respond to his request for an interview. NEWS : Touring & Splitting! As we mentioned last issue, one listen to that free live EP inside Gary Moore' s album was enough to dampen our enthusiasm to see Paicey live on Moore's UK tour. However if we'd had some of your reviews earlier it may well have changed my mind: "I was quite impressed, they played nearly all the Corridors Of Power LP with a few tracks from Moore's other solo albums. Don Airey came over really well, much better than on Rainbow tours. 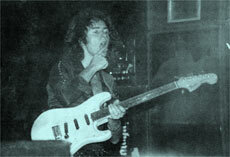 Neil Murray played a good gig and was much more to the forefront than he'd been in Whitesnake. As for Paice, well what can I say apart from brilliant? He's given more chance to stretch out than with Whitesnake, his solo was the highlight of the gig; he got the biggest cheer of the night". Andy Hardman. They are now mid-way through a tour of the USA and Canada. "In Ottawa they did a solo gig in a small club for 200 people. Paice did a wild drum solo and got a standing ovation" writes Andy Szczepanik, who says they were mostly supporting Def Leppard along with Krokus. Although the evening was designed to show off Paiste cymbals, Ian Paice's new Pearl kit was the star of the stage. Proceedings got under way, and he launched into a drum solo. Now I'm used to solos from some distance away at concerts, but this - amplified only through tiny speakers (which I suspect were inaudible anyway) was something else... It was amazing to hear the kit completely clearly. There was then a brief slide show followed by a lengthy demo of every cymbal Paiste do - Paicey merely walloping each one to order. He then discussed Pearl drums. He said he'd always vowed he'd play the best kit around. Previously these had been Ludwig, but he'd recently found the quality deteriorating, and had decided to change, eventually opting for a natural wood finish Pearl kit. By 'The Royal Orchestra And Friends'. The friends in question are Don Airey (who also arranged and conducted), Neil Murray, Gary Moore, Graham Bonnet, and Ian Paice! Paice's drumming is good but not spectacular. He is only on four cuts. I don't really see the logic in trying to give Police tracks a middle of the road orchestral treatment, as they appeal to a wide range of the populace anyway. I much prefer the originals to these covers. One of many positive reviews. UK release came in late December 1982. Following the US release of the Hughes/Thrall album, the band spent October through to December doing live concerts, usually as supporting act to Santana. They also made a promotional visit to Japan. In their interviews there they sounded in good spirits, and the stories of a bust up which emerged soon after came as something of a surprise. They were due to make a second album in February (they recorded or wrote enough for a double in the first place), and follow this with dates in Japan and Australia in April / May. A British visit was being arranged for late summer. There can't be many people who haven't heard the Ian Gillan joins Black Sabbath stories, and we've yet to have a single letter from someone who thinks it's a good idea. He was offered the job back in August 1982, but didn't make his mind up until early 1983. Whether Blackmore's rejection of Deep Purple reunion plans set for this summer caused him to take it we obviously don't know. Since the announcement Ian and the rest of Sabbath have been down in the West Country writing and rehearsing off and on, Ian I presume letting his voice have the break it was due for anyway. A Reading Festival slot will probably be their only UK gig this year, as they plan to hit the US trail in August - good-bye Ian. With the poor showing of 'Stone Cold', the follow up - 'Death Alley Driver' - got shelved, though the promo video did escape on some in-store video screens in early 1983 and on a K-Tel type chart compilation video called 'Videoteque'. Some of you found Ritchie dressed as Death in it quite disturbing! The late 1982 European tour had a set list close to that of the US dates. (The photo opposite was taken by Frans Van Arkel). It ended in late November, and since then all has been quiet. The story goes that the band were given notice as per usual, but only Rondinelli appears to have gone. In May Rainbow skipped over to Sweden to write, rehearse and ultimately record a new studio album. The first proper authorised history of Deep Purple yet published. It's by Chris Charlesworth, a Melody Maker writer who first saw Purple at the Plumpton show in 1970, and wrote numerous articles on them from thereon. He approached Omnibus Books with his idea, and finally signed on the dotted line late in 82. He then set about getting interviews, and wasn't 100% successful in this, being unable to stir Blackmore into a response of any kind. Roger did a lengthy cassette interview and Glenn Hughes did likewise, although he failed to grasp the seriousness of the book and gave rather standard answers to the questions. David Coverdale was lined up, but promptly went off on holiday. Rod Evans was located but couldn't be got to reply. On the more positive side, Jon Lord managed to fill a quantity of C90s in a marathon interview. lan Paice gave of his time freely, and lan Gillan spoke at length too. We'd just located Nick Simper and set up an interview, so rather than make him waste two days going over the same ground, I let Chris have a transcript of the one published this issue. Six out of nine then is quite good going. Chris also went in search of other related personnel, old roadies like lan Hansford and Mick Angus, producers Derek Lawrence and Martin Birch, and managed to get the full cooperation of Tony Edwards and John Coletta. This book should then be a must for all Purple fans. It certainly makes a damn good read - Chris has styled it like a book rather than the easy cop out of a diary format - with a lot of new facts coming to light or at least being explained properly for the first time. Whitesnake 1982-83 UK Tour Reviews....Deep Purple Vintage Video Feature...Rainbow Bootleg Reviews..